The Lundy Painted furniture range is another stunning range of furniture created by an English manufacturer. Crafted from solid pine this has some great elements of design which although feature heavily on this range it's not over powering, the stepped detailing on the plinth, the lovely sculpting to the tops it is all 'just right' a good balance between design and form. 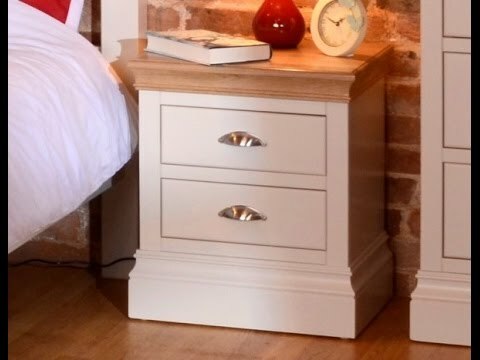 As said earlier this exquisite range is solid pine throughout finished in a gorgeous Ivory paint with metal cup handles for drawers, metal knobs for doors and all of this is then topped with solid oak that are finished with a satin lacquer. As with all of our ranges the Lundy comes in ready assembled with the only exception being the beds and tables but these will be assembled on site by our experienced delivery team and if the wardrobes are a bit big to go up the stairs they will dismantle and reassemble in the room all for no extra charge.